30 n Performance & Hotrod Business n December 2014 PERFORMANCE Edelbrock LLC Torrance, California Smitty Smith Technical Sales Coordinator for Edelbrock LLC/Russell Performance Plumbing Our hottest Nitrous Oxide product for the performance aftermarket is … …without a doubt our Progressive Nitrous Controller #71900. 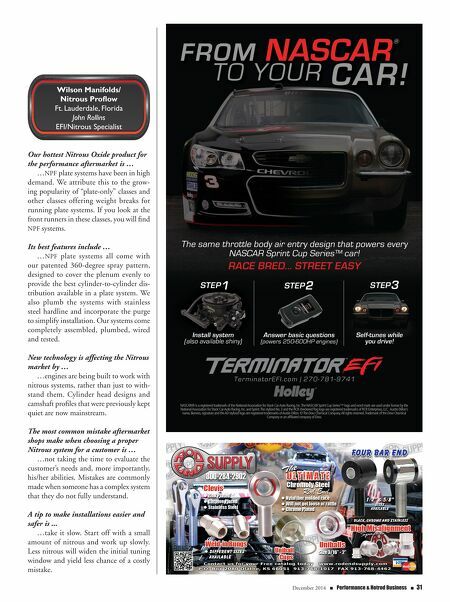 Its best features include … …all of our Progressive Nitrous Controllers are epoxy-potted for durabil- ity in their aluminum housing, so when a racer is doing burnouts and sometimes they shake their tires, our controllers are not affected. They also utilize pulse width modulation to regulate the amount of nitrous being delivered over a speci- fied time, and feature integrated battery voltage. Non-volatile data memory retains your settings, and there's plus-12-volt timer out- put for auxiliary output. They are single or dual ramp adjustable from 0 to 9.999 sec- onds, and include full digital circuitry with easy-to-read LCD display. The racer can select and individually program nitrous parameters to optimize traction and chas- sis control. 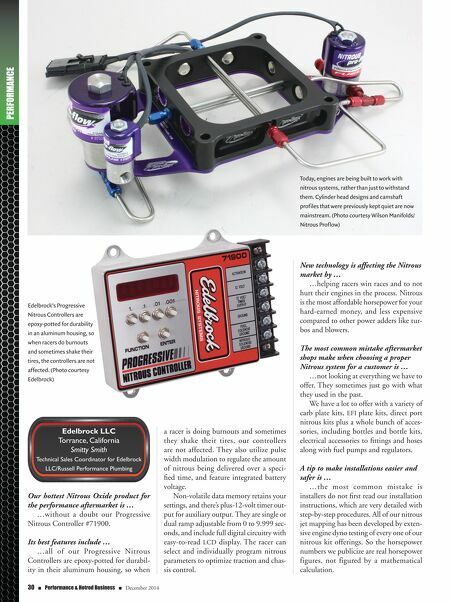 Edelbrock's Progressive Nitrous Controllers are epoxy-potted for durability in an aluminum housing, so when racers do burnouts and sometimes shake their tires, the controllers are not affected. (Photo courtesy Edelbrock) Today, engines are being built to work with nitrous systems, rather than just to withstand them. Cylinder head designs and camshaft profiles that were previously kept quiet are now mainstream. (Photo courtesy Wilson Manifolds/ Nitrous Proflow) New technology is affecting the Nitrous market by … …helping racers win races and to not hurt their engines in the process. Nitrous is the most affordable horsepower for your hard-earned money, and less expensive compared to other power adders like tur- bos and blowers. The most common mistake aftermarket shops make when choosing a proper Nitrous system for a customer is … …not looking at everything we have to offer. They sometimes just go with what they used in the past. We have a lot to offer with a variety of carb plate kits, EFI plate kits, direct port nitrous kits plus a whole bunch of acces- sories, including bottles and bottle kits, electrical accessories to fittings and hoses along with fuel pumps and regulators. A tip to make installations easier and safer is … …the most common mistake is installers do not first read our installation instructions, which are very detailed with step-by-step procedures. All of our nitrous jet mapping has been developed by exten- sive engine dyno testing of every one of our nitrous kit offerings. So the horsepower numbers we publicize are real horsepower figures, not figured by a mathematical calculation.